Extra place offers are just one of the numerous opportunities to make a profit matched betting. They provide a possible high return for a relatively small outlay. What are Extra Place offers? Bookmakers regularly run promotions where they pay an extra place on a sporting event which can be used by matched bettors to return a profit. Extra place offers usually come about at the time of major sporting events such as Ascot or the US Open and give customers an extra place on their each way bet. 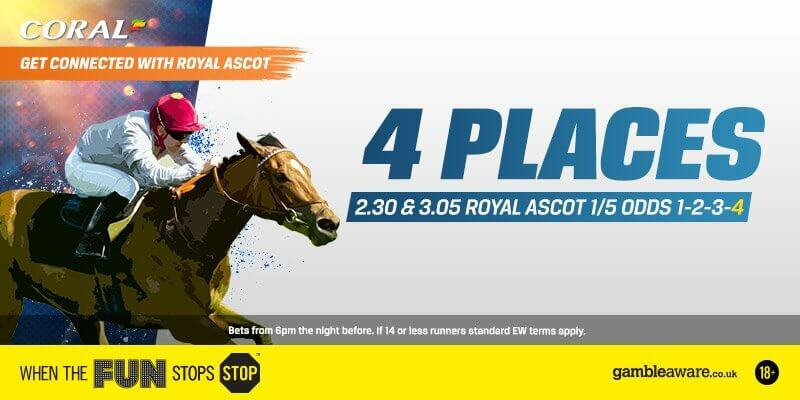 For example, if a bookmaker usually pays out on each way bets at Ascot for horses that finish 1st,2nd,3rd or 4th, with an extra place offer they will also pay out if your horse finishes 5th. The same goes for other sports such as Golf. If you place an each way bet on Tiger Woods winning the US Open and the bookmaker would usually pay out if he finishes in the top 5. If they are running an extra place offer they would also pay out if Woods finished in 6th place. What are Each Way bets? If you place an each way bet, you are betting on your selection to finish in the top X places. The number of places varies depending on the event but is predetermined by the bookmaker. Your stake on an each way bet is split equally into two bets. Half of your stake goes on your selection to win and half of it gets placed on your selection to finish 2nd or 3rd (or however many places the bookmaker is paying out on). The half of your stake that has been placed on your selection to win will be paid out at the normal odds but the half that has been placed on your selection to finish 2nd or 3rd will be paid out at ¼ odds (usually ¼ odds but this can vary). For example. We want to bet on a horse race which is paying each way bets for the first 3 places at ¼ odds. We place a £10 each way bet on a horse at 10.0 (9/1). If the horse wins we will receive £50 from the win bet + £16.25 from the place bet. If the horse finishes 2nd or 3rd we will receive just the £16.25 from the place bet (9/1 ÷ 4 = 3/2 odds). To make a profit from extra place offers your horse must finish in the extra place. For example, if the bookmaker usually pays out on 3 places but with the promotion is paying out on 4 places, then your horse must finish 4th in the race. To ensure we take a minimal loss if our horse finishes in any place other than 4th, we must lay the each way bet. Each way bets on betting exchanges usually match with the same amount of places that bookmakers offer. So if the bookmakers are paying out on 3 places for each way bets on a race, the betting exchanges will also be. However, if a bookmaker is paying out on an extra place, this gives us an opportunity to make a profit! A bookmaker is paying an extra place on a horse race so now pays out on the first 4 places instead of 3. The betting exchange is still paying out on the first 3 places. 1. We place an each way bet on a horse at the bookmaker. 2. We lay the win and place markets on the exchange for the same horse to cover all outcomes. If the horse finishes 4th, we’ll win our place bet at the bookmaker and we’ll also win both our lay bets at the exchange as the horse didn’t finish 1st, 2nd or 3rd. To place your lay bets on the betting exchange you will have to place 2 separate bets. One lay bet on the horse to win and one lay bet on your horse to place. This means that we have to do a little maths to work out the odds for the place market. For example. If your horse has win odds of 25.0 you would subtract 1, giving you 24.0, divide by 4, giving 6.0, and finally add 1, giving place odds of 7.0. How much can you profit from Extra Place offers? Our horse has to finish 4th in order for us to make a profit. Therefore, more often than not, we will not profit from this offer. However, this doesn’t mean that the offer is not profitable. Lets take a look at an example bet to see how much profit we can make from an extra place offer. We pick a horse which has odds of 25.0 (24/1) and place a £5 (total stake of £10) each way bet on it at the bookmaker. The bookmaker usually pays out on the 1st 3 places but with the extra place, is paying out on the first 4 places. There are ¼ odds for a place. £5 has gone on our horse to win. £5 has gone on our horse to finish 1st to 4th at the bookmaker. Using the calculations mentioned previously, our place odds are 7.0. Let say the exchange price is 7.2 for laying the place. As you can see, we only make a profit if our horse finishes in the extra place. However, a profit of £34.87 far outweighs the small losses of between £0.13 – £0.32. With an average loss of £0.26, this gives us odds of 135/1 that our horse will finish in 4th place. Not a bad bet! In the above example we have used a £5 each way bet. If you have the bank and increase your stakes, you can make a lot more profit. When first starting out with extra place offers we strongly advise to start with small stakes. These bets won’t come in every time and so you need to have enough bank to continue with your other matched betting offers should they not. Hopefully this article will have given you an insight on how to profit from extra place offers and how much profit you can potentially make from them over time.